HARRIS COUNTY – Local voters showed support for their elected officials and passed every proposition in the state, county, and City of Baytown on Tuesday. In Harris County, all seven Propositions passed. Proposition 1 for road improvements at about $700 M. passed by 73% to 27%. Proposition 2 about funding improvements to parks passed 64% to 36%. Proposition 3 for an improved animal shelter passed 62% to 38%, the lowest of all county percentages. Proposition 4 for flood control work passed 74% to 26% So the county can spend $64 M. to drain the areas. One Proposition that did not pass was the City of Houston, Proposition 1, the HERO proposition was voted down 39% to 61% on election day. For Mayor of Houston, Sylvester Turner had 32% and Bill King had 25% while Adrian Garcia had 15%. Turner and King will face each other again in a run-off election in December. Based on preliminary figures from the Harris County Clerk’s office, voters in the San Jacinto College District have given their approval for the College to move ahead with a $425 million bond measure to fund new construction and renovation projects throughout the District. The unofficial count of Tuesday’s election saw nearly 68 percent of voters in the College’s taxing district approve the capital improvement bond program, with a vote of 17,247 for the referendum, and 8,300 against. This year’s voter turnout totaled more than five times the number of total votes cast in the 2008 bond election. The votes will become official after the San Jacinto College Board of Trustees canvasses the election on Nov. 16. According to Lieutenant Governor Dan Patrick, “Texans have spoken loud and clear by voting all seven propositions into law today from property tax relief to transportation. LEFT: 40 homes, and cars were under water in the Channelview area, according to the Harris County Office of Emergency Management. RIGHT: Homes in some neighborhoods were completely flooded, as were streets and cars. Frontage roads along I-10 East were closed by authorities most of Saturday. NORTH CHANNEL – During this past weekend rainstorms and tornadoes struck the Houston area. East and Northeast Harris County were particularly hard hit by rainfall where up to 13 inches fell in some neighborhoods. In the greater Houston area, six tornadoes were reported from Freeport to Highlands. In Jacinto City, and along the East Freeway near Federal Road, high water caused closing of frontage roads. No deaths or serious injuries were reported, but a great deal of property damage from flooding was sustained. There have been reports of flooded homes in Highlands and Channelview near the San Jacinto River, in Crosby and in Cloverleaf near Carpenters Bayou. There have been reports of structural damages due to high winds from tornadoes that touched down in areas including Pasadena, La Porte, Highlands and Friendswood. White’s Cemetery in Highlands took a major blow from a EF-0 tornado, toppling trees and tombstones, tearing up lawns and bringing down power lines. Sheriff ’s deputies had to close FM2100 through Barrett Station for most of Saturday afternoon and evening. It is not too late to report damages to your home or property. Below are resources and contact information for residents affected by flooding and wind damage. Isaiah Henry caught the ball and left a defender on the ground before scoring a touchdown for the Mustangs. Friday night the North Shore Mustangs faced off against the Bulldogs of LaPorte in an important game the winner would become the district champion. Windy weather added only added to teams tension as both teams drove down the field on their first possessions, only to miss the field goal attempt. The score was 00 at the end of the first quarter. However, things picked up for the Mustangs in the second quarter as they scored 17 points a field goal by Aaron Cuevas, a 15 yard TD pass from Bryant Badie to Isaiah Henry, and a four yard rushing TD by Carl Guillory. In the third quarter the Mustangs kept rolling with QB Bryant Badie scrambling for a seven yard TD run. Then, as the Bulldogs center snapped the ball over the head of their quarterback, the Mustangs fell on it in the end zone for a safety, adding another two points to their commanding lead. The final score of the game came on a four yard rushing touchdown by QB Maciah Long. In a game that had important implications regarding playoff seeding, the Mustangs dominated on offense, defense and special teams. 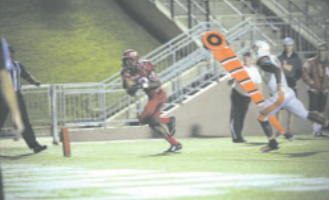 Next up, North Shore plays Port Arthur Memorial November 6 at Port Arthur Memorial Stadium in Port Arthur, TX. LULAC president/founder Cruz Hernandez, Jr. was the official host for the Roast, as Joe Stephens grins. 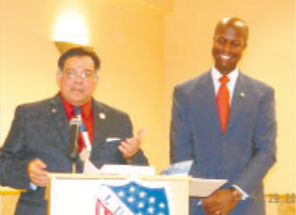 LULAC Council #4703 held their 15th Annual Roast N Toast last Thursday evening, and the honoree was local businessman, former basketball star, and president of the Galena Park school board, Joe Stephens. The dinner and roast were held at the Jacinto City Town Center. Roasters & Toasters for the evening were State Rep. Ana Hernandez, Pct. 2 Constable Chris Diaz (also an honoree last year), Galena Park’s John Moore and Crystal Murray, and Joe’s cousin Dr. Cedrick Smith. As in any Roast, Joe’s foibles were exagerrated, but his accomplishments far outshone them. He was a basketball star in the GP 1991 state champion team,and later spent 4 years in the NBA with the Houston Rockets. He now concentrates on activities involving mentoring youth, and he received high praise from his Toaster for this quality. He want to continue work with youth, as a Justice of the Peace to follow Judge Mike Parrott next year, he says. Joe was grinning, and grimacing, most of the evening as he heard of his life’s foibles, from childhood to today. He also was grinning because he was just a new father a few days before, his third daughter.